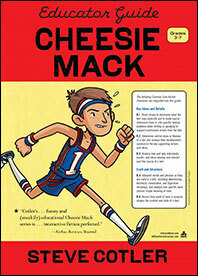 For a child reading a Cheesie Mack book, my first goal is fun. I am hoping that your child or student gets caught up in Cheesie's humor and his joy in being an active, inquisitive (sometimes impish) kid. But I have other, equally important goals. I hope to transfer Cheesie's curiosity (he finds something interesting in almost everything that life brings him) to every reader. Finally, Cheesie is smart, and he knows it’s beneficial to be smart, but he doesn’t make a big deal of it. Maybe valuing intelligence will transfer as well. And Cheesie has a good vocabulary. Cheesie's website supports all these goals: fun, curiosity, and valuing intelligence. Oh, the thinks you can think! You are oh so clever, just like Cheesie, and I completely enjoyed your presentation. You have a wit that thoroughly engaged the students, a quick pace, and you truly earned my admiration. The teachers are all raving about how great your presentation was! What can I say? The fifth graders were very engaged and it was great for them to meet an actual published author. You certainly have a wonderful way of teaching them about characters. You reached the kids!! I also think you motivated more kids to want to read, and that is awesome! It's great when they can have another voice teach them--you did a fantastic job!! I know they are looking forward to more books from you! Wow! You are a rock star! The kids loved your presentation and so did I! 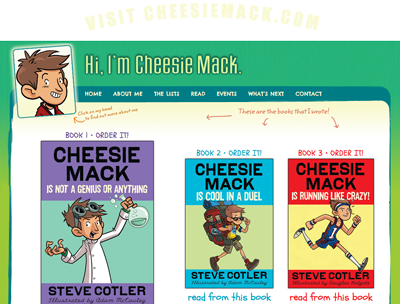 If you would like to utilize the Cheesie Mack books in your classroom or as a parent at home, there are dozens of ideas in the Cheesie Mack Educator Guide. The following COMMON CORE ANCHOR STANDARDS are integrated into the Educator Guide: R.1, R.2, R.3, R. 4, and R.6.